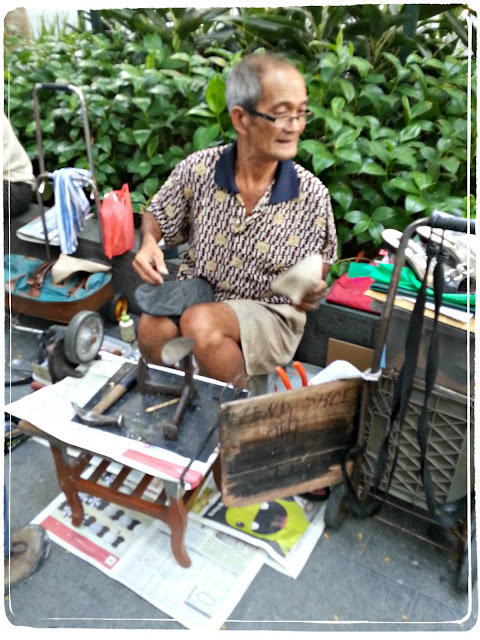 Do you know what is a cobbler? Not those that you see in a small shop inside a mall but those that really work manually with rubber, nails, glue, filer, cutter etc. I think younger generations does not have the opportunity to see or meet a true blue cobbler. 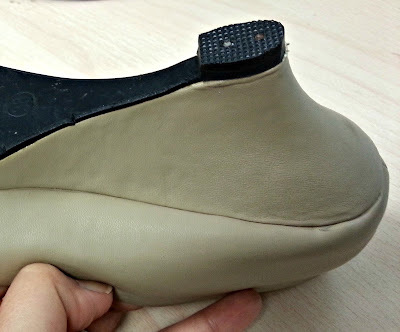 Now, when their shoes have holes, heels that comes off they simply just throw then away OR head down to that shoe repair shop in the nearest mall. 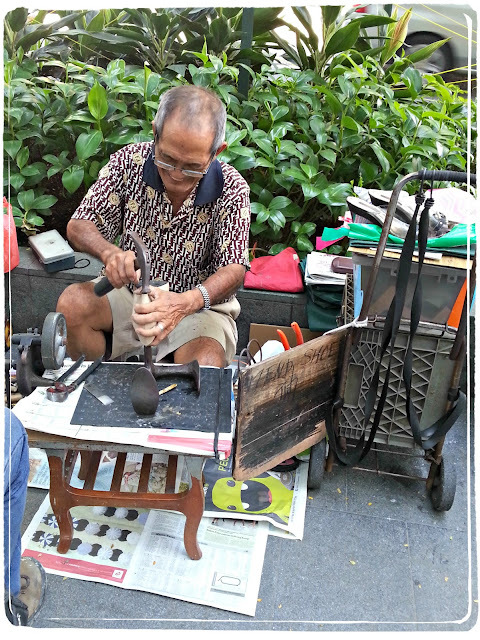 I not only have the opportunity to see cobblers during my younger days but I have a favourite one too! This uncle has been at the spot since I first saw him 2 decades ago at the carpark next to the Phoenix Hotel. Back then, there were a few cobblers in that area but as years gone by he is the only one who is still around. When Phoenix Hotel was pulled down, the carpark demolished, Specialist Centre pulled down, the area fenced up for the construction of 313@Somerset, he moved around but always not far away from the area. You can always see him at the traffic light between the now gone Specialist Centre and Peranakan Place. Then few months ago they have to corner off that area for some construction and move the traffic light to where Courts Orchard is, he moved with the traffic light. Uncle sets up his small make shift work area almost every day at around 11am. However recently, due to his age and health plus the crazy weather that suddenly decides to rain heavily at unpredictable hours, he is around only Mondays and Tuesdays. 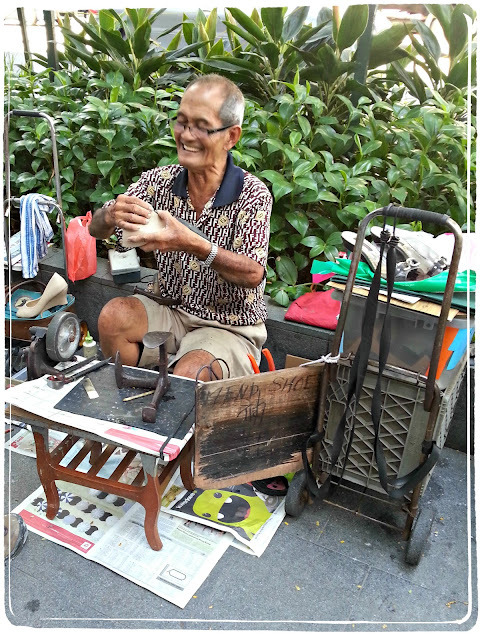 Though I do not know uncle's name, I know that he is very friendly, courteous and always a big smile for every one who seeks his help to repair and mend their pair of shoes. Uncle speaks Chinese and dialect, he understands and speaks simple English but you have to speak real slow. Also uncle's ears are not as sharp as they used to so you may have to speak louder then usual. 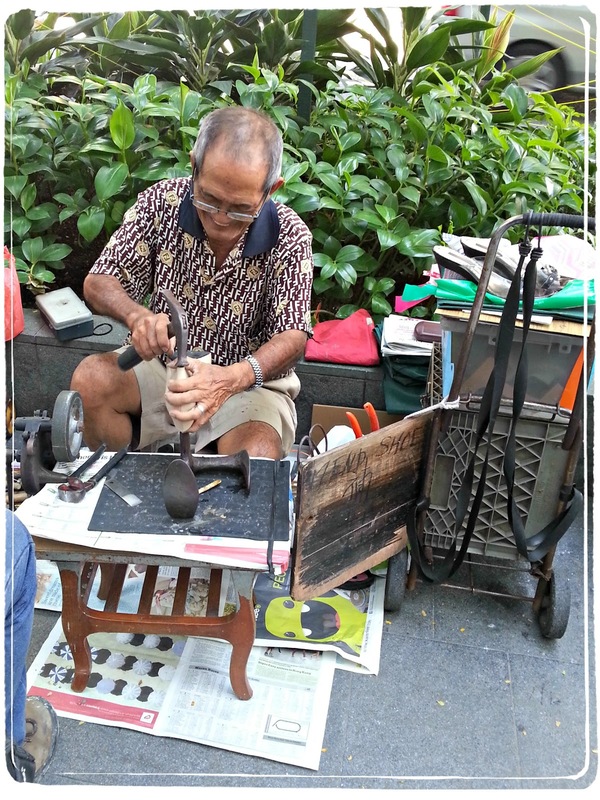 Since I started work in Orchard some 6 years ago, I have been going to uncle to fix my heels. Those drains, gaps or holes in the pavement are really a killer, a heel killer! 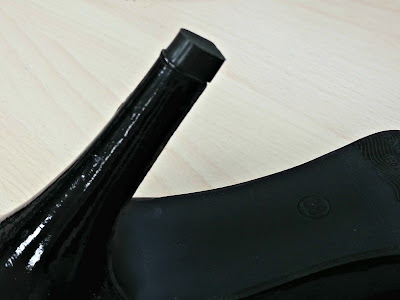 I always get caught on them and when I try to pry my heels loose the rubber comes off. This afternoon I went to see uncle again and he saved my 2 pairs of almost brand new heels! Guess how much I paid for the repair? Only $12 for 2 pairs of shoes! Its cheaper then those shoe repair chain shop who probably will charge this price for only 1 pair of shoes. Perhaps some of you can get a cheaper price but I'll still go to uncle because I feel that I've know him most of my life (even though he do not remember me), most importantly I have faith with his superb workmanship. By the way, since uncle is only around 2 days per week he is pretty busy especially during lunch time so drop off your shoes before heading off for your lunch, you should be able to collect them when you are done. He is outside ZARA in 313@Somerset, if you still cant find him, look for the traffic light from 313@Somerset to Courts. Look around, you can't miss him unless he did not "open shop" that day. I think he's not around weekends also... never see him leh! Plus you wear size 38! :p Me 40... wonder what size Ler Ling wears? OEI! read post or KPO my shoe size??? Ya i think weekends biz no good ba every one there to shop instead.